The coveted Order of the Grey Squirrel was established in December, 200l by the Board of Directors of the Theatre Arts Guild as a reward for excellence. The name was inspired by a stuffed grey squirrel that appeared on the set of almost every production during several years immediately prior to the establishment of the Award. The squirrel’s antecedents are unknown, but are assumed to be impeccable as, in a truly inspirational fashion; the squirrel always performed flawlessly and left no mess. 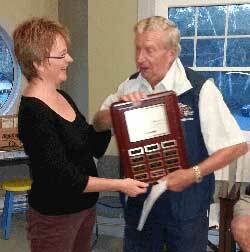 2017 - TAG President Rayna Smith-Camp presents the Grey Squirrel Award to Nick Jupp. 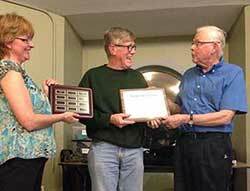 2016 - Board member Bill VanGorder and TAG President Rayna Smith-Camp present the Grey Squirrel Award to Darrel O’Neil. 2015 - Angela Butler, President, and Bill VanGorder, Executive Producer, TAG, present the Grey Squirrel Award to Phil Reid. 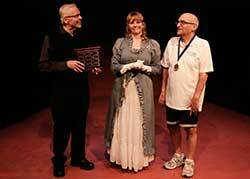 2014 - Bill VanGorder, Executive Producer, TAG, presents the Grey Squirrel Award to Angela Butler. 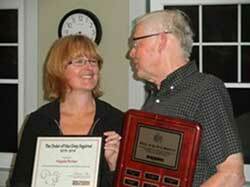 2013 - Angela Butler, President, TAG, presents the Grey Squirrel Award to Hugh Vincent. 2012 - Nick Jupp, Past President, TAG, presents the Grey Squirrel Award to David Seager, who is accompanied by his wife Hélène. 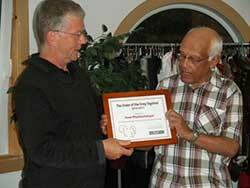 2011 - Nick Jupp, Past President, TAG, presents the Grey Squirrel Award to Amal Bhattacharyya. 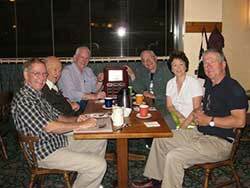 2009 - The Grey Squirrel Award is presented to the "Thursday Crew". Photo (left to right) Joe O’Brien, John Gratwick, Austin Reade, Bill VanGorder, Barb Hart, Nick Jupp.